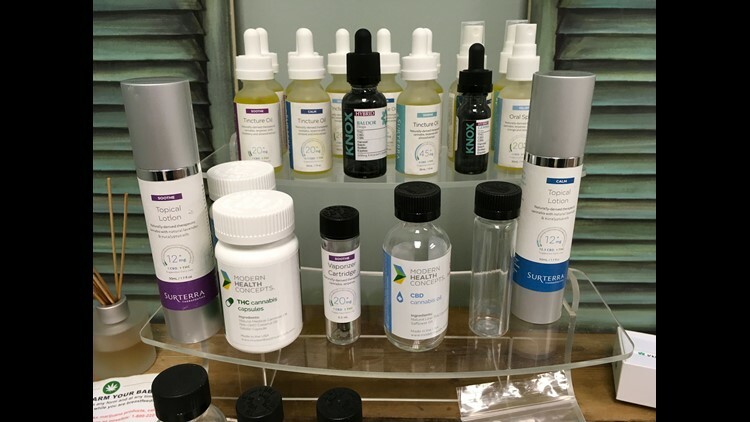 Examples of different medical marijuana products a patient could purchase at a dispensary are seen Wednesday, Aug. 30, 2017 at Southern Comfort Marijuana Clinic in Port St. Lucie. FORT PIERCE, Fla. — School districts across Florida continue to defy state law with policies banning students' use of physician-recommended medical marijuana. Yet even on the state level, it's hard for school districts to know what rules to follow. Florida Statutes require every school district to write a policy on medical marijuana. But voters, 71% of whom approved a medical marijuana amendment to the state Constitution in November 2016, also exempted schools from providing “any accommodation of any on-site medical use of marijuana” in that vote. Each district school board shall adopt a policy and a procedure for allowing a student who is a qualified patient ... to use marijuana. ... Such policy and procedure shall ensure access by the qualified patient; identify how the marijuana will be received, accounted for, and stored; and establish process to prevent access by other students and school personnel whose access would be unnecessary for the implementation of the policy. “State law doesn’t trump federal law," said general counsel Mitchell Teitelbaum of the Manatee County School District, who has led workshops on the issue for the Florida School Boards Association and the Florida Association of District School Superintendents. The state is sending mixed signals to school districts, he said. As of 2016, Colorado, Maine and New Jersey also allowed students to use marijuana in school for medical purposes, according to the Education Commission of the States. Washington state specifies that schools aren't required to permit use of medical marijuana but may do so. That "drug-free" designation also plays into at least three counties' refusal — Indian River, Martin and St. Lucie — to make those accommodations for students, even when the kids have had medicinal-marijuana products recommended by a physician. The districts make no distinction between medical or recreational marijuana. Both are banned. Brevard County school officials justify their ban by pointing out that on school grounds, state law limits administration of medical marijuana to students with approved caregivers. "Nurses and/or other administrative staff, who are not caregivers, are not ... permitted to administer medical marijuana to students," said Jennifer Wolfinger, Brevard schools spokeswoman. Lee and Collier county school districts in southwest Florida also ban medical marijuana, yet advise parents to talk with their children’s principals to work out a plan for student use, officials there said. Still, some Florida school districts, including two of the largest — Broward and Palm Beach counties — do allow students to use medical marijuana. Nothing in this section shall require any accommodation of any on-site medical use of marijuana in any correctional institution or detention facility or place of education or employment ... "
Broward County School District officials, who approved their formal policy Tuesday, require a parent to bring the medical marijuana to school and administer it to the child. In Palm Beach County, a parent must bring the medicine to the school nurse, who administers it to the student and returns it to the parent at the end of the day. The district's nurse, are not school district employees, officials point out. Teitelbaum, the Manatee County schools attorney, said he advises districts to follow federal law but to have compassion when dealing with children's health.